This stretch of coastline was exactly how I’d imagined it to be. A kind of sepia image of the past, everything tinted with fatigue and abandonment. The green of the grass and roadside plants was not as vibrant as further south, the fences were solid red with rust and people looked windswept and hardy. That’s not to say it wasn’t pretty. 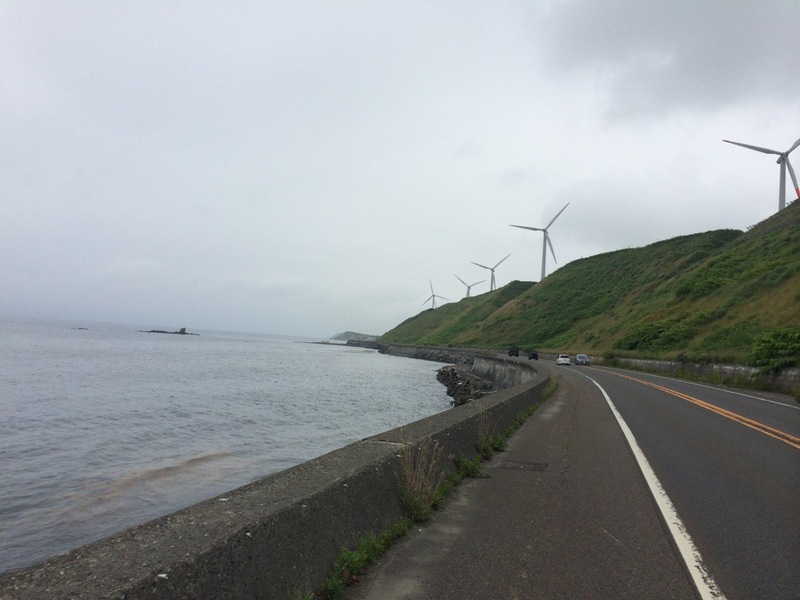 But with the sky a low hanging grey and the sea like an old piece of tin foil smoothed out to the horizon the feeling of cycling back in time only grew with every pedal north. I stopped for lunch at the only shop in Shosanbetsu and had to shout extremely loudly four times before the owner appeared from the back room wiping sleep from his eyes. But as sleepy as Mr. Abe (no, not the Prime Minister) was he was not unaccustomed to travelers. 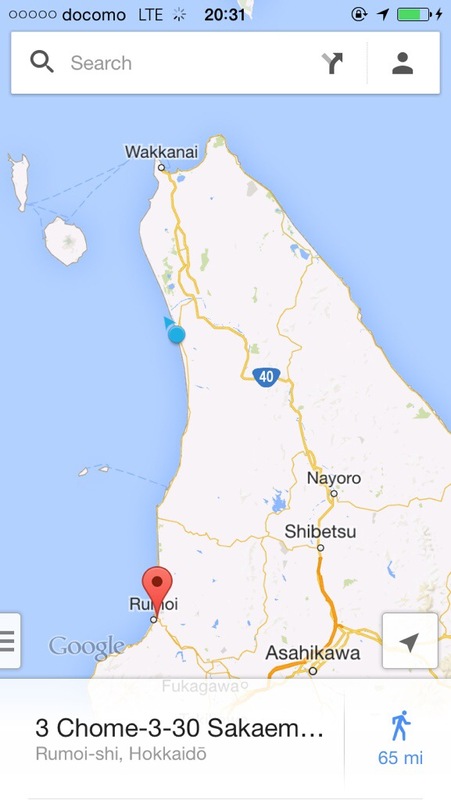 The road from Rumoi to Wakkanai that follows the coast is virtually the only road any long distance traveler would take. He proudly showed me his scrapbook with notes and photos of those who’d stopped by his restaurant (this was probably most people as there wasn’t really anywhere else to eat). 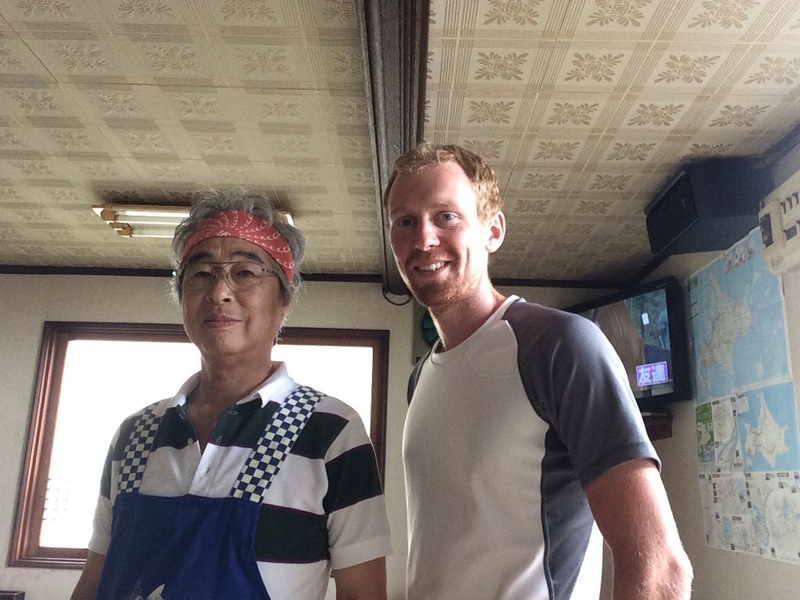 His first foreign guest had been a Californian Surferdude who was walking around Japan back in 2004. In 2011 he’d fed and hosted 3 Americans who had cycled a similar route to me (I’d looked at their blog during my preparations). I added my note and we took turns to pose for photos and then I left him to resume his nap. Tonight’s accommodation is a portacabin with the words SUPER HOUSE written modestly on the side. At only ¥200 it is cheaper than pitching my tent – I’m not an idiot.